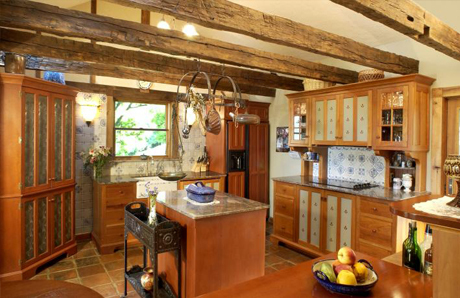 This country style kitchen in its restored New Jersey farmhouse is completely open to the foyer and great room. 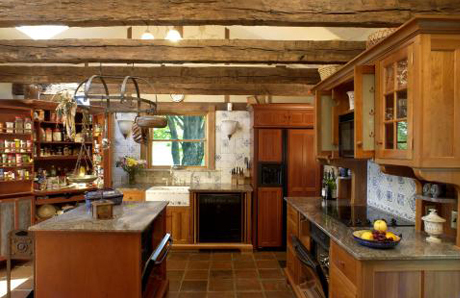 The owners needed a low-tech look to properly integrate the kitchen into the period open beam style of the living areas. 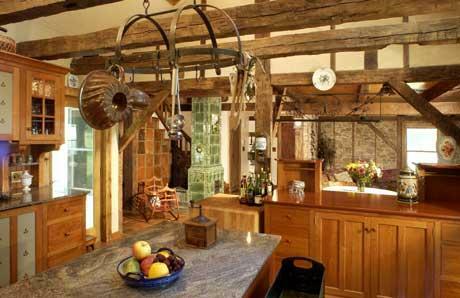 The original hand hewn beams were meticulously restored after a fire gutted the interior of the home. The owners chose to expose as much of the original structure and finishes as possible, and it it evident throughout the home. To achieve a compatible country style look for the kitchen, the independent workstation pieces with their varying shapes, sizes and finishes were so appropriate. And YesterTec’s ‘hot’ appliance hiding technology is crucial to maintaining the country style theme. After all, 150 years ago, this home would have had furniture, not cabinetry in its original kitchen. Six unfitted workstations were used to safely hide three ovens, a dishwasher and all the small appliances. The kitchen measures roughly 14′ x 14′ and features pieces finished in our Hampton’s Cherry and Natural Cherry stains with Copper Swirl granite. Note the green ceramic stove in the foyer, a relic that was found in the owner’s ancestral East German home and imported and reassembled once again. This true antique set the precedent for using independent sculptural pieces in the open-plan kitchen to enhance the country style of the home. Tucked away behind our flipper door system are two ovens (one is in the island) an over-the-range microwave, and a standard dishwasher. A cost effective GE Profile Refrigerator is semi-concealed and enclosed in its own freestanding furniture piece (PR36-D). Many small appliances are concealed on the working counter top of the Corner Pantry (CP34) unit that features pierced tin doors w/ spice racks attached to each interior side of the doors. A huge amount of accessible storage is available above and below the interior countertop for food and cookware.